Robert M. Patterson was named the 6th Director of the Mint in May, 1835. One of his first decisions was to hire Christian Gobrecht as Second Engraver. Patterson also brought aboard artists Thomas Sully and Titian Peale to prepare sketches for a new silver dollar coin. Gobrecht took the ideas supplied to him by Sully and Peale, combined them with a few of his own, and transformed the resultant design into metal. In October, the new dollar proposal was shown to Treasury Secretary Levi Woodbury and President Andrew Jackson. Both men approved, advancing the project forward. Many months passed before the full design was finalized. Liberty was pictured seated upon a boulder, gazing over her right shoulder, while holding a Union shield in her right hand. Her left hand supports a pole with a liberty cap stuck on the end, a statement of American freedom. An ascending eagle in flight dominates the reverse, meant to symbolize optimism in the nation's future. In November 1836, the first pattern Gobrecht Dollars were coined, thought to number 18 or so, and these were distributed to certain locations in Philadelphia to gauge public reaction. Director Patterson had instructed Gobrecht to place his signature conspicuously below the base on these first examples, but this quickly drew harsh criticism from a local newspaper. 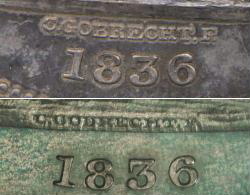 Gobrecht then relocated his name in tiny letters to the base of Liberty, as seen in the specimen above. Other than the signature flap, the Gobrecht Dollar was generally well received. The first Gobrecht Dollars are properly called pattern coins, and numbered 18 or so. These coins were characterized by the engraver's name, "Christian Gobrecht F." (F. is Latin for FECIT, meaning "he made it"), quite noticeably between the base of Liberty and the date (see top photo). When a newspaper rebuked this as the work of a "conceited German", Gobrecht quickly relocated his name to the bottom of the base, where it drew less attention (bottom photo). A total of 1000 Gobrecht Dollars were minted for general circulation in December 1836. Another 600 were produced in 1837 of .900 fineness, but were dated 1836. In 1838, a couple dozen more Gobrecht Dollars were coined, considered as patterns, having 13 stars around the obverse outer edge and no stars on the reverse. Just 300 of the Gobrecht Dollars were struck in 1839, all of them targeted for circulation. Interestingly, all Gobrecht Dollars were struck with a proof finish, including those intentionally released into circulation. These are the only proof U.S. coins ever minted for use in everyday commerce. There are many varieties of the Gobrecht Dollar because of the presence or not of stars and/or the designer's name, and edge type. Mintage figures for all are difficult to estimate precisely, because of a limited number of Mint restrikes in the 1850's and 1860's. In 1837, the Gobrecht seated Liberty design was introduced on the dime and half dime, giving rise to the "Seated Liberty" coinage theme. The quarter adopted Seated Liberty in 1838, the half dollar the year after, and the silver dollar in 1840. Even though Gobrecht's flying eagle reverse was widely endorsed, it did not appear on Seated Liberty coinage. Instead, the heraldic eagle and shield, first seen in 1807 and once ridiculed by Director Patterson as an absurdity, was chosen for the reverse. All Gobrecht Dollars are extremely rare. Collectors of average means typically do not have a prayer of ever owning one. Proof-65 examples sell for about $100,000 or more, sometimes much more. From an affordability standpoint, the least expensive is the 1836 variety with "C. GOBRECHT F." on the base, eagle flying left amid stars on reverse, plain edge. Although quite scarce, this is the most frequently found Gobrecht Dollar, as it was minted for general circulation. 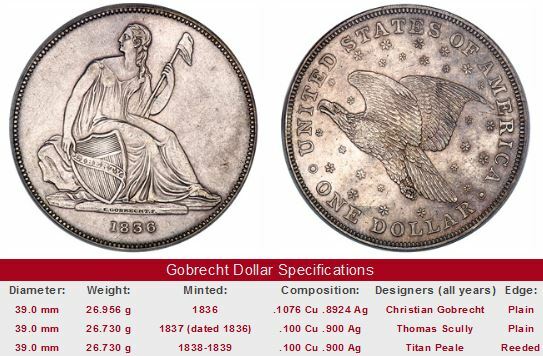 It could be a serious mistake to buy a Gobrecht Dollar that has not been certified by one of the four most respected grading service companies: PCGS, NGC, IGC, or ANACS. Some of the lesser known services *might* be fine, but these draw much less respect from dedicated numismatists, usually for good reason. If you set out to become a Gobrecht Dollar owner, sooner or later you'll be rubbing elbows with this class of collector, so you might as well become one yourself, if not already. The left hand side of the "Sales Box" below is value trend data over a very long period of time for an 1836 Gobrecht Dollar in XF-40 condition. The percent annual increase is computed for comparative purposes. The right side of the box is a link to eBay US coin auctions, that pulls all 1836 Gobrecht Dollars, if any, that are currently for sale. Most likely, no genuine examples can be found on eBay coin auctions at any given time, so keep checking back.